Starting tomorrow I'm going to correct a serious problem in my life, one day at a time. I'm ashamed to say that my Bible reading isn't what God expects from me. It's my earnest desire to spend more time delving into His Word and learning what He would have me be as a Christian and a woman. Are we willing to schedule time each and every day to study and search the Scriptures? It's not just another chore to check off our to-do list, but a real opportunity to meet God face to face in His Word. The answers to our questions and our prayers are written right in front of us, and it's our responsibility and great joy to find them. What's the best gift you can give back to the Lord? Your faithfulness. I don't mean gift as in, God should feel honored that I decided to be faithful. I mean gift as in, we have been blessed more than we deserve and our faithfulness is all we have to give in return. God has been far more faithful to us than we could ever hope to be faithful to Him. He has provided everything we've ever needed and many of the desires of our hearts. He has answered when we called. He has simply been there when no one else was. The Lord has followed through on every promise ever made and our faith leads us to believe He will continue to do so throughout eternity. On Saturday (or Monday if you're already procrastinating), many people around the world will make New Year's resolutions. They will decide this is the time to overhaul their eating, weight, home and life in drastic ways. It may last until this time next year, but chances are these off-the-wall decisions won't make it a week, let alone a month. We should desire to make positive changes in our lives, and improve ourselves according to the Lord's standards. Any move in that direction is beneficial to ourselves and our families, but not the resolutions that we can't stick with more than a few days. In just a few days 2010 will be a memory and we'll have new goals and plans for 2011. Before the calendar page flips, why don't we take a moment to remember all of God's blessings during the past year. All right, that might take longer than a moment, but what you'll see is more than worth the time. To make my remembrance walk last until this time next year, I'm using a small notebook to jot down my thoughts, recollections and some mementos from these past 12 months. 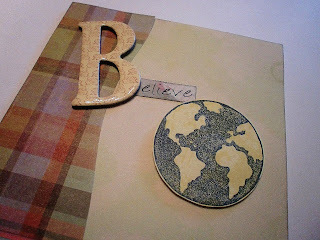 You can make a similar scrapbook or you might want to use a jar or box to hold some precious memories. So...what to include in your time capsule? * How did you begin the year? A party? With family? At home or work? * Think back on last winter. Pull out your calendar and make some notes about major events from the first part of the year. 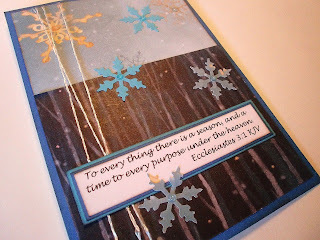 Work your way through the seasons, marking those special days God blessed you with. Celebrating Christmas far away from family can create some serious homesickness. Being on the east coast while my family is in the Midwest gives me incredible empathy for our missionaries serving on foreign fields. It's difficult to be separated, whether by a few miles or half a continent. But lately I've been even more homesick for Heaven than Iowa. (Yes, there's a movie reference there.) The old song speaks of longing for a country you've never seen, but you're still desperate to be there. I've never met my God face to face, but part of me already knows the joy that exists in His presence. To have that intimate communion for all eternity is a precious gift that we get impatient for. The space under the tree is empty and the presents are unwrapped. The food prepared yesterday is now leftovers packed up in the fridge. Company will soon be leaving and life will get back to normal. But what will the next days hold for a Christian woman who just celebrated the birth of her Savior? Does getting life back to normal mean that we lose the joy that this wonderful Christmas day brought? Do we return to complacency or do we surge forward with praise on our lips? The choice is ultimately each individual woman's. I'm looking forward to my everyday routine starting tomorrow, but not the laziness I felt before this week. Setting aside the things of God like Bible study, journaling and prayer time is pure laziness, because we allow the things of the world to come before that precious time with the Lord. It's finally Christmas Eve! Just one more day and we'll celebrate the birth of our Savior! What glorious anticipation! I'm sure your home is busy today preparing meals, wrapping gifts and attending evening services. In the midst of the hustle and bustle, I pray you'll take a few minutes alone with the Lord. Choose one of the following ideas and get charged up for the weekend with God's Word. * Read Isaiah 9:6. Which name of Jesus Christ means the most in your life today? * Read Matthew 2:1-12. What personal gifts does Jesus desire from us now? * Read Luke 1:26-38. Meditate on what have been going through Mary's mind this day before her child's, and her Savior's, birth. * Read Luke 2:8-14. Listen to "Hark The Herald Angels Sing." * Read John 1:1-16. Light a candle and praise the Lord for sending us the Light of the World! When the weekend has come and gone, what will you remember about your Christmas celebration? Will it be the joy of Christ's birth or the headache of Christmas shopping? Will it be the warmth of family by the fireplace or getting into a cold car every morning? Will it be the peace of enjoying the still, cold, evening air or the anxiety of having a clean home, prepared meal and purchased presents? Will it be the hope of the Savior's arrival or the disappointment of those who can't be with you? Will it be the love of family around the dinner table or rushing to get the meal prepared? Will it be the fun of Christian fellowship with believers of like faith or dealing with everybody pushing and shoving through the mall? It's all about perspective, and I pray that with our eyes on Christ our perspective will be clear. I would hate to reach the end of the Christmas season and realize that I had been so focused on the negative that I had neglected all the positives. Guess how many people you will interact with between now and the end of Christmas Day. 10? 25? 50? 100? More? Each and every person you speak to, pass by, help and serve is a soul loved by the Lord. It may not be so apparent when we're all hurried, frazzled and snippy, but our words and actions all have a tremendous impact on how others perceive the birth of our Savior. Even strangers can tell if you are a Christian - without you ever saying a word. The week is passing by with great speed, but will you take the time to smile at the checkout lady? Will you ask her how she is today? Will leave her with a "Merry Christmas" or are you so caught up in your to-do list that you don't even give her a passing thought? You may be the only Gospel she receives today, and wouldn't that be a wonderful Christmas gift? Do you have your menu for Christmas meals ready? Are you prepared to go grocery shopping? Is everything pulled out to decorate the table? We put so much time and effort into preparing the dining table for holiday meals. Christmas may be the only time each year that we're surrounded by so many loved ones, so this is an important centerpiece of the day. Once the linens have been spread, the flowers and candles are in place and the dinnerware is laid out, the people take their seats. Whether there are two of you or a table-full of family and friends, Christmas is complete around the edge of the table. Grace is spoken and God rests His hand on each in attendance. This Christmas season, we need prayer more than ever. Illness, depression, conflict, death and other personal concerns are threatening to steal our joy. In less than a week we celebrate the birth of our Lord and Savior, but prayer is necessary at this very moment. Will you pray with me? Can you even begin to imagine what that first Christmas carol must have sounded like? With those glorious words in their hearts, the shepherds hurried off to find the babe, wrapped in swaddling clothes and lying in a manger. Perhaps, with joy and hope of hearing the Christ child had arrived, they were singing along the way. What better time is there to make melody in your heart than at Christmas? 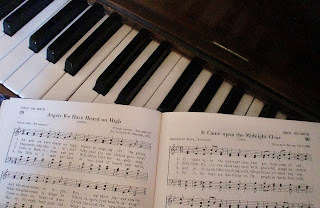 The joy and anticipation of the birth of our Savior creates a feeling that can only be expressed in song. In just a week we will celebrate the birth of the Christ child. We rejoice in the new life, the hope of His coming and the gift of salvation. The birthday of the King rejuvenates our love and faith in beautiful miracles. Now let's fast-forward to a later chapter of the story. That tiny baby has grown up and is now the focus of hateful and evil men. He has been arrested, tortured and hung on the cross to die a humiliating death. He is mocked, scorned and hated from every side. That's not the Christmas story...that's the Easter story! We don't want to think about the ugly and the brutal and the sin. Advent is about expectations and renewal. Christmas is about birth and life and joy. Thinking about Jesus' death doesn't fit into that pretty, pure picture. Over the past several days I've been scared to death by other drivers driving while talking or texting on their phones. The man behind me in the grocery line yesterday informed someone very loudly through his hands-free device that he was waiting patiently at the grocery store. Then he changed lines so he could get done faster. The woman in front of me at a different check out lane in another store was so consumed with her phone call that she didn't even hang up to interact with the clerk. Technology is the quickest joy-destroyer there is. Yes, I use it daily and appreciate that I can communicate, work and entertain myself with it. It is a blessing in many ways, but in addition to connecting us with the world it is alienating us from the world around us. The rush has ended momentarily. After a very busy few weeks I find myself with a whole day to myself. No Christmas parties, no planning, no deadlines and no errands. I can finally catch up on some writing projects, our etsy shop and the slightly neglected housework. And then I realize...I am empty. I've given and written and crafted and sent and spoken and...I'm empty. My energy is drained and I think I'm coming down with a cold. The desire is still there, but I've run out of motivation. In a word, I'm human. It is at these moments that I am blessed by God. It isn't a contradiction, but the beauty that is our Lord. We pack our calendars to tightly at Christmas time, and then run ourselves silly trying to accomplish it all. The source of all time, energy, love and courage, our God has an endless supply of everything we require to serve Him. A decade ago I wrote a newspaper article about how much it would cost in the present day to purchase all of the gifts in the song, The 12 Days of Christmas. I contacted local merchants and added up all of the birds, jewelry and service providers - the total came to almost $50,000. Today the gifts are equally outrageous. The price of technology has gone through the roof so we can have convenience at our finger tips. Entertainment is overly important and under-appreciated. If you send nothing at all, you are considered cheap and thoughtless. Each woman who attended the Christmas party for our Ladies' Sunday School class this past weekend received a wonderful gift to take home. It was a folder full of holiday recipes collected from all the ladies of the class. We asked them to write them out in their own hand writing and we made enough copies for everyone to have one. They were collected in a folder and were waiting on the table when they arrived. These are priceless recipes, each with a family story behind them. They ranged from main dishes to appetizers, side dishes to desserts. In this collection are tips and ideas that have now been passed on to new generations of cooks who want to bless their homes with delicious Christmas meals. I wonder what your tree topper is. It may seem like a silly thought, but work with me here. Is it an angel, watching over the holiday festivities? Do you have bows tied to the top with ribbons cascading down? Perhaps there are flowers or wreaths or bears or birds. 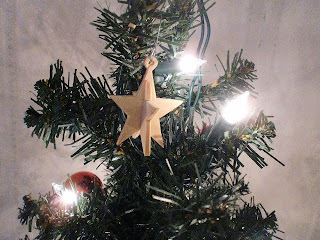 But more often than not, there is a star. It may twinkle. It may change colors. But it send out that warm glow over the whole tree, lighting up the balls and garland below. The very basic reason for the star is the remembrance of how the visitors found the Christ child that precious, special night. As you worship the Lord today and celebrate the Advent season, I ask that you remember the missionaries serving God around the world. Many of them will not be able to return from their foreign fields to celebrate Christmas with their families. They may be on the other side of the world in two weeks, rejoicing alone or with a few immediate family members. You know, it's getting harder and harder to find nativities anymore. They're just taking the Christ out of Christmas. Not at our house, was my quick reply. Others may turn to commercialization and the lure of large purchases, but there are still many families around the world that are centered on the true joy of Christmas - our Savior! The nativity means joy: the angels brought that joy to the shepherds so they could pass it on to others. That's our joy, too. The nativity means fulfillment: the wise men knew the Savior was coming and this lovely family scene was the answer to their prayers. It is the answer to our prayers, too. What a joy yesterday was! I spent most of the day at the craft bazaar of a local Christian school. 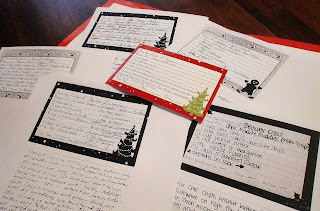 My table was full of Christmas cards, other greeting cards and all sorts of paper and wood crafts – all covered in Scripture and bathed in prayer. These creations are my heart, and it's such a pleasure to share them with students and their parents. Each class had the opportunity to come through and shop the little Santa's Workshop area, and the little ones were the cutest. They practiced reading our “Stuff From Trees” sign, and many checked to make sure everything we had came from trees somehow. I got stumped, though, when one boy asked if the marker I used to write my price tags cam from a tree...what quick minds they have! * Christian School Bazaar - I have the special opportunity to be part of an area Christian school's craft bazaar for two days. The children have a few dollars to spend, and the vendors provide items that are $5 or less. This way the students can purchase a few small gifts for their parents, siblings and other loved ones on their own. The school just asks that we return part of our profit, which we lovingly and willingly do. 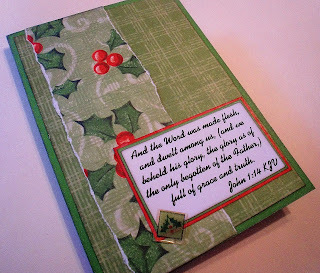 What a privilege to be able to supply my cards and gifts, all covered with Scripture, to children. You'd never know it is Christmas if you walked into our house right now. 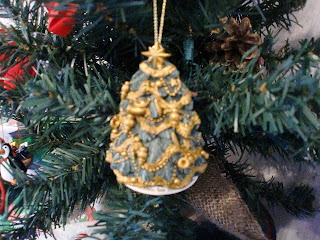 We have scheduled ourselves so tightly lately that there are only a scattering of decorations around our home. The occasional ornament and holly sprig don't seem to add a holiday feel to an otherwise ordinary day. Some people feel that the decorations make it the Christmas season. Some hurry to get their decorations up so they'll be the first, the largest or the best. Others want to show off their talents, budgets and ideas. And the results can be glorious, lovely show pieces. So...yesterday I was passed on the interstate like we were in a NASCAR race. People were in such a hurry that it didn't seem to matter some of us choose to do the speed limit. There was somewhere so important to be that weaving in and out of traffic became less of a threat and more of an importance. Once I arrived at my destination, some other ladies shopping were in such a hurry that they pushed their way through crowds, cut people off and snatched product off the shelves to get it before someone else. Even as I was putting my change back in my purse at the checkout, the woman behind me was already pushing her way in. During the Advent season this irritates me more than usual. I want the people around me to be as full of joy about Christmas coming as I am. For me it's not about presents or decorating or parties, but focusing on the anticipation of our soon-coming King! This month is my busiest time of year. Many days I am at the mercy of other's people's needs and schedules as we plan parties, attend events and get things accomplished. This creates a full calendar, a full plate and an overly-full mind. All I want is a moment of peace. The confusion of the world says cram it full...try to do more...be busy and you'll be happy. But I don't want happiness. I want God's peace. That's the greatest gift of all time, and it won't be wrapped under a tree. The peace of God passes all understanding, and that peace began in Bethlehem. When Jesus Christ came to earth, He brought a beautiful, perfect peace with Him. Nothing man-made can begin to compare with the peace that comes from our Savior. With His arrival came peace. With the teaching of the Gospel came peace. With His perfect will came peace. Many places already have snow on the ground - we do not. In our area we may not see snow, or at least it will only be here for a day and then disappear. That's one of the trademarks of the South. A white Christmas would be picturesque this year, but it's probably not a probability here. But that also means no shoveling, no tracking into the house and no scraping off the car in the morning. Preventing the extra work is a lovely thought, but sometimes it would be nice to watch a gentle snow fall from the window by the fireplace. Have you had many fires in the fireplace this winter season? Here in South Carolina it's only been cool enough for a couple of weeks, so we've had logs burning almost every day. The joys of the fireplace are that warmth and glow that spill out of the flames. 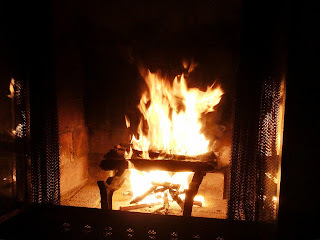 There's nothing more cozy than a crackling fire and the soothing heat it creates. During the Christmas season many companies use fireplaces in their advertising to conjure up images of family time and togetherness. We associate the warmth of the fire with the warmth of our love and devotion. The apostles had that same comparison in their personal interactions with Jesus Christ. 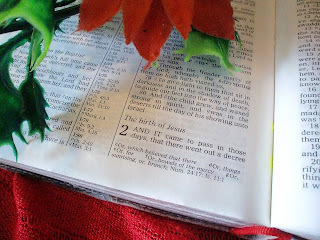 In the very last chapter of Luke, Jesus met with His disciples again, telling them about Scripture and sharing a meal. His presence and attention had a profound impact on their hearts. Our Christmas cards are in the works. I say that at this time every year. Sometimes they get sent out and sometimes I am disappointed because they don't go out. Christmas cards are one of my lazy, procrastination problems in the December of every year. And that is very sad. As Christian women we have been entrusted with the ability to share our faith through the written Word. With just a few scribbles of our pen, we can change the world with the story of God's love. One of the joys of having my in-laws staying with us for a week is the opportunity to share and learn. 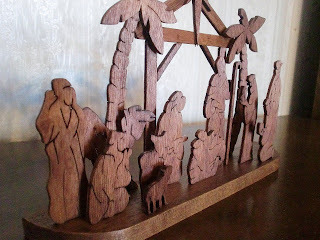 We have several boxes of Christmas decorations that they used before they went to Mongolia as missionaries, and I never knew the story behind many of them. So they stayed wrapped up and tucked away. I got to learn about my husband as a child. I heard memories of a family I haven't been part of for very long. I caught up on family history, grew in my knowledge of world cultures and solidified my relationship with a precious Christian woman - all through a few boxes of Christmas decorations. 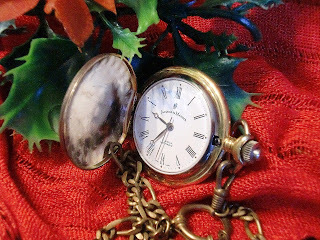 Pieces that I thought were outdated and musty suddenly had a history and meaning to go with them. It is suddenly the first day of December - where has the year gone? Moment after moment has passed into the past, and I pray that you have used many of them to grow in the Lord. Perhaps you've read your Bible through in a year. Or maybe you've done a personal study over a single book or a few chapters. Regardless, God's Word is the foundation of growth. There is nothing in this life more important than studying God's Word - diving in, immersing yourself, drinking it in - and learning for yourself exactly what the Lord has designed you to be. Between now and Christmas, over the next 24 days, read the story of our Savior's birth every day. Look through Luke Chapter 2. Marvel over Matthew Chapters 1 and 2. Join John in worshiping the Word in Chapter 1. Even Isaiah and the other books of the Old Testament speak to the coming of our Lord. The season of Advent is that beautiful time of the year when we both anticipate the return of Jesus Christ and count down the days celebrating His birth. While Advent begins the fourth Sunday before Christmas, we often look to the first day of December for our starting point. Over the next 25 days, we are going to look at Advent from the victorious Christian woman's perspective. How can we separate ourselves and our families from the trappings of Christmas commercialism? What can we do personally to recover the joy of Christmas and experience the miracle of His birth? Stay close and we'll discover the answers together. I have no idea what your day looks like. I don't know if you're scheduled within an inch of your life for the next four weeks. I don't even know if I am...and that's a scary thought. My calendar and I are in two different rooms, and without that I don't know my own schedule. I just know it's going to be a busy month. But the motivation behind that busyness often gets lost in the shuffle. We're planning...we're asked to do things...we're expected to be places...and we're trying to accomplish everything we can in a short period of time. But why? Is it truly about celebrating Christmas? Is it honestly about sharing the Gospel with our loved ones? As you glance at your calendar frequently over the next few hours, days and weeks, ask yourself some serious questions. * Are you making time to spend with the Lord? * Have you scheduled yourself so tightly that you're rushing from one thing to another? Bailey is my protector. 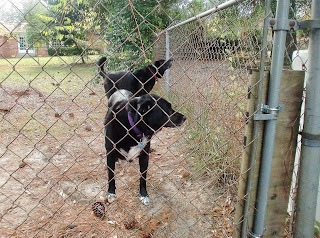 The big dog is the one who stays at the front door and the windows, watching for potential danger. She's the one with the deep growl and the threatening bark. She's also the one who loves belly rubs more than life itself. She's the one who will whip you with her lab tail while she shakes with pleasure over your mere presence. She's content to curl up with her head on my leg and drift off into a nap knowing her human is safe. I'm convinced that part of our calling to keep the home is protecting our pets. Bailey protects me above all else, and it's my responsibility to make sure she is safe and secure. Last weekend I was working in the far end of the house when I heard Bailey barking. She was outside in the beautiful fall weather, so I assumed she was chasing squirrels. They love to torment her, and I don't think she really minds it all that much. So I worked my way to the back door to return our neighborhood to peace and quiet. For our Bible study meal a couple of weeks ago, we were using a Mexican theme. I was asked to bring a dessert, so immediately I started doing some recipe research. 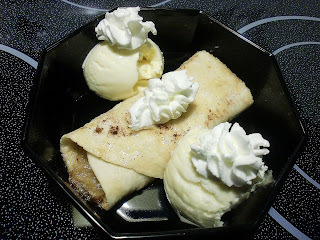 What I ended up making was a huge hit for any nationality! Please enjoy these apple enchiladas as much as we did! 2. Spoon fruit evenly onto each tortilla and sprinkle with cinnamon and nutmeg. Roll up tortillas and place seam side down on lightly greased 9x13 baking pan. 3. Bring margarine, sugar, brown sugar and water to a boil in a medium sauce pan. Reduce heat and simmer, stirring constantly for 3-4 minutes. 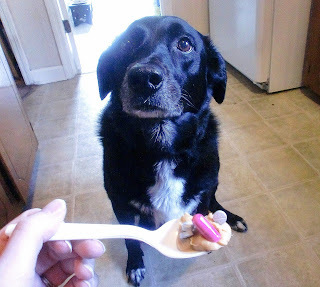 Stir until all of the sugars are dissolved and the mixture is smooth. In the midst of everything else you're working on today, take a few moments now to reflect on the blessings God has placed in your life. Give thanks for all He has done in your life! Our pastor's wife gave us this idea in Sunday School recently and it was a real eye-opener. I pray you have a blessed Thanksgiving Day. For each letter in the word Thanksgiving, write one blessing God has bestowed upon you that begins with that letter. May God continue to bless you in each of these ways and many more! My list ended up like this: Today to serve Him, Home sweet home, Amazing family, New mercies every day, KJV Bible of my own, Salvation, Gladness in my heart, Inexplicable joy, Victory over sin, Immediate and intimate communication with Him, Never-ending love, Grace when it's needed most. Happy Thanksgiving! May God continue to bless you exceeding abundantly above all you could ask or think. Thanksgiving dinner is already in the works, family are on their way and you're checking your list for tomorrow over and over. 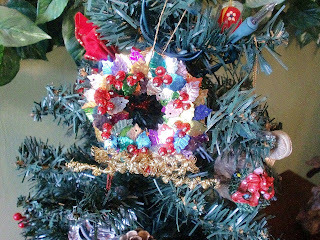 Slow down, take a deep breath and have some fun making wonderful holiday decorations. 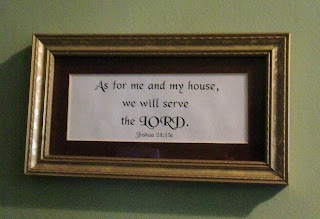 The house: * Why sweat over a cluttered house? Throw stuff in a basket and tuck it away until the weekend. 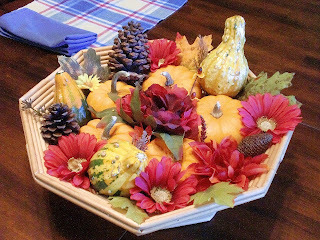 * Tuck various bits from your fall decorating into a basket. * Coordinate napkins, place mats, cups, plates...whatever makes you think of the holidays.But keep it simple! * Ask the kids to make place cards for the table or design place mats on white sheets of paper. You'll keep the occupied and know they're part of the celebration. Everyone has books and magazines around the house. But almost no one I know can read an entire book in one sitting - that offers the opportunity for you to share your faith by making these lovely corner bookmarks. What blesses my heart about these bookmarks is that they're very out-of-the-ordinary. 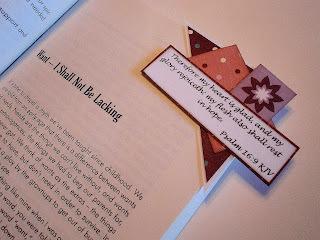 Everything overlaps off the bookmark itself and features lovely Scripture! Each bookmark is made from one corner of an ordinary envelope. Cut off the bottom two corners (the ones that are opposite the flap) at an angle large enough to fit easily over the edge of a book page. For an interesting angle, cut one edge longer than the other like the far left example pictured here. From there, the sky's the limit! For these, I cut triangles to fit inside each corner, leaving a little bit of white showing around the edges. The more layers the better in my estimation, so there are both coordinating blocks and flower die cuts on each. Time flies when you're having fun, but don't let it go by so quickly that you don't get your holiday packages shipped in time. The deadlines for getting Christmas gifts boxed and sent off are quickly approaching, so mark your calendar now. Dec. 23 - Normal pickup and delivery service for air, international and ground packages. * UPS Next Day Air packages picked up today will arrive on Friday, Dec. 24. UPS 2nd Day Air packages picked up today will arrive on Monday, Dec. 27. Dec. 24, Christmas Eve - Normal delivery service for air, international and ground packages. Have you ever been so over-scheduled and over-booked that you've just wanted to collapse? Perhaps you've just wanted to cancel the day for lack of interest? God never intended for us to extend ourselves past the point of caring. Our service to the Lord is to be joyful and uplifting, not a chore that needs to get checked off for the day. As we head into the busiest season of the year, let's take just a moment to reexamine what we're writing down in our planners and put God's plan where it belongs - first! * Time in fellowship with the Lord comes before all else. A humble heart first thing in the morning sets the stage for the rest of the day. Energize from the start and ask God what He would have you accomplish today.